With our wedding coming up in a little over two months, Mr. P and I are starting to feel the excitement of one of the biggest moments in our life. To celebrate, some of my closest friends put on a wonderful couples party to shower us with love before the big day! If you didn’t pick up on it in our engagement photos, I love the style and charm of all things vintage. One of the best parts about celebrating “vintage” is the many ways (and time periods!) that you can use for inspiration. For a modern-day vintage celebration it’s not about recreating the past, but rather giving new life to unique ideas that have been forgotten. 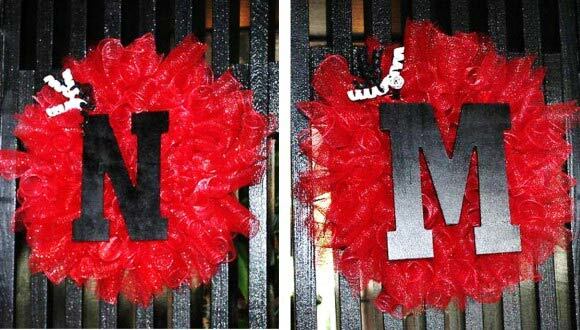 For the color scheme of the couples shower, the girls went with black, white, and red. This worked perfectly because not only did this go with the “vintage” vibe they were shooting for, but also happened to be the colors of the interior of the country club where the party took place. Upon arrival, the walkway into the main area was decorated with two red wreaths with black monogrammed letters – one for the bride (that’s me!) and one for the groom (Mr. P). 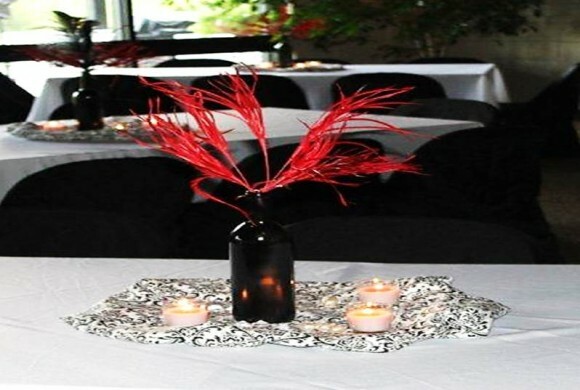 The tables were decorated with black painted wine bottles filled with a red filler on black and white damask fabric. For the food area, the tables were draped with white linens and the center focused on two red glass candles with a beautiful black fan on the wall. Do you recognize any of the pictures? That’s right! Our engagement photos fit right in with the decorations of the shower. The cake was a two-tiered black and white cake with a outlines in red and a monogrammed topper. 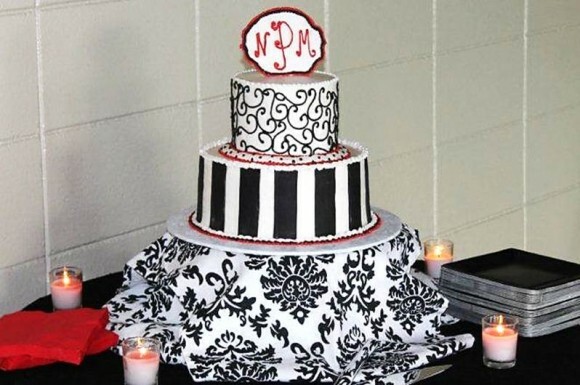 One tier was black and white striped while the other tier was white black swirls. 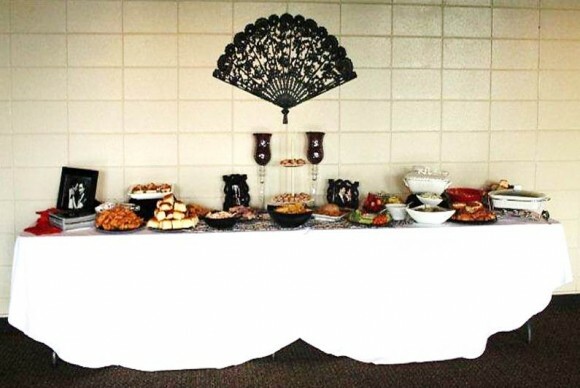 To tie the table decorations with the cake table, the black damask fabric was used for the base of the cake also. 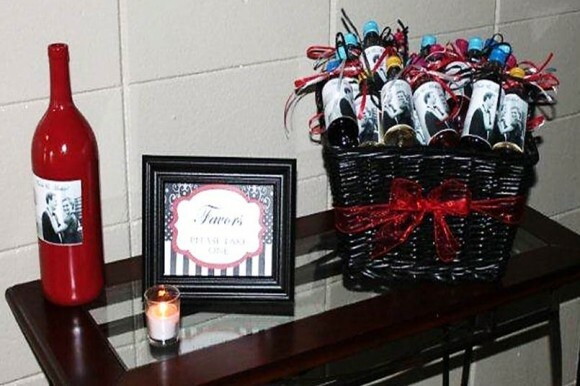 For the favors, single serving wine bottles were labeled with one of the black and white engagement photos. We had so much fun at our couple’s shower and I can’t thank my sweet friends enough for making us feel so special and loved!